As the site of the former Alcoa, Inc. West Plant, this once industrially used property is well positioned as one of the state’s premier locations with redevelopment potential for commerce at a regional scale. The City of Alcoa in fact has long envisioned this property as a unique opportunity to establish a new commercial and civic hub, with residential opportunities, as part of an area designated for more compact mixed-use development activities (i.e., primary city center or downtown concept). The master/vision plan development was overseen by the City of Alcoa Planning Division of the Planning and Codes Department. A main point stressed before the consultant team was that the plan be flexible and should serve as a vision to guide redevelopment of the site. 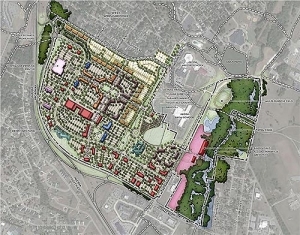 In addition to development of the master/vision plan by the lead consultant team of Kiser + Vogrin Design and Volkert, Inc. of Franklin, TN, an advisory group was formed to assist in providing technical level expertise. The City of Alcoa’s vision for this master/vision plan was to create a primary city center or downtown concept on this site to be reliant on a functional transportation network and the coordination of outlying land uses. The objective to developing the plan was to make correlations between the site’s broader transportation network and land uses, and this downtown concept to achieve positive synergies. Further, transit opportunities were also to be accessed for future local and regional type services.